After 19-hour journey I've arrived home. Back home, nice. But shortly what I found was my father, indulged in collecting all kinds of gadgets. Internet shopping has already been a new hobby for him, and an annoying problem for my mother. "They're continuously arriving. It would count more than thirteen or fourteen. none of them is expensive, but I mean, useless!" said my mother. I took a look at the gadgets purchased. What's the matter? 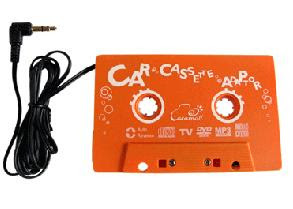 Totally fine, I thought I didn't need to worry about his new hobby, until I get today's third delivery: it was a cassette-like device which redirects any audio-out to the cassette player of a car audio. "Father, if you don't want to use your mp3 player with earphones, you can burn a CD, or bring your laptop with the new speakers, or the portable speaker." "But I want to listen music in my mp3 player with car audio while driving. This one exactly suits my need. Moreover it's very cheap! By the way Auction (a Korean internet shopping mall) is amazing. Whenever I feel "there should be something like this" and search for it, there is always what I'm seeking for. And it recommends similar products very well." Indeed, this gadget was only about 1 euro, and looked quite cute. But my mother again started nagging at him, now aided by her new weapon raglja. And I couldn't help myself joining it. "Oh my, maybe we should have not invented search technologies. The industry rigorously developed the content match system, and now it's helping your toy shopping!" This is called raglja. you can make a really loud sound by holding its handle and spinning. It's mostly used for cheering. I think Slovenia should export it. :D My mother loves it! Virtual Memory sure is becoming cheaper these days. I wonder when we will eventually reach the rate of 1c to 1 GB. I can't wait for the day when I will finally be able to afford a 20 TB hard disk . But for now I will be satisfied with having a 32 gig Micro SD Card in my R4i.